An update for European PlayStation 4 and PS4 Pro consoles has made it far easier to use them for more than gaming. 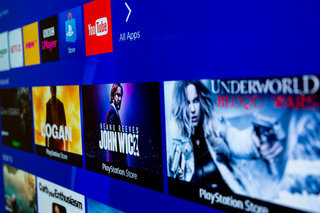 An all-new TV & Video interface has been introduced that aggregates all the video and telly apps, plus PlayStation Store digital purchases and rentals in the one place. It highlights shows and films you can buy or rent, or content on individual apps, such as Now TV, in order to head straight to them rather than clumsily navigate through individual platforms. Even user generated content is available through the new hub, mainly through YouTube. Featured titles now appear front and centre when you enter the TV & Video section, with popular content updated regularly. This will also be gleaned across all your available apps and services, as well as from PlayStation itself, so you can find free videos to watch alongside those available for one-off payments or as part of a subscription. Your video apps will now be ranged along the top of the hub, giving you instant access to services such as Netflix, Amazon Video, Now TV and TV from Sky. The new TV & Video experience is now available in the UK, plus Austria, Denmark, Finland, France, Germany, Italy, Norway, Spain and Sweden. It has also launched in Australia.